TRAVELERS Laura Siegel and Bob Wenokur appreciate the “all-inclusive” offerings of a Bahamian resort. The reasons for travel take on many forms: adventure, exploration, to learn about different cultures, to visit family, to rejuvenate the soul, or just to lie on a beach with the love of your life. Whatever the reason may be, whether venturing 20 minutes or 5,000 miles from home, travel is essential. For Laura Siegel and Bob Wenokur, traveling often means “getting away from it all.” Several years ago, before tying the knot, Bob and Laura saw a Sandals Resort television commercial. Later that night, they booked their first “all-inclusive” vacation. The trip took them to the Royal Bahamian Spa Resort on the island of Nassau in the Bahamas, where they were wowed by the locals and the abundance of activities. “We fell in love with the idea of all-inclusive and how easy it all is,” says Laura. The “all-inclusive” package included their room, food, drinks, activities (including water sports, snorkeling, kayaking, sailing, ping pong, shuffle board, etc.). “Our hardest decision each morning was ‘do we sit at the pool or the beach today?’” laughs Laura. 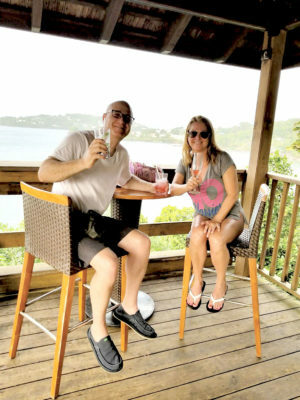 The now-married couple has continued to return to the Sandals resorts on several occasions, including a trip to Antigua and to St. Lucia, also in the Caribbean. They love meeting people from Florida, New York, Texas and other parts of the world, including Great Britain and Canada. But most of all, they love being together. As a complete counterpoint to the “all-inclusive” travel method, there’s always the “fly-by-the-seat-of-your-pants” method. Back in September, while sitting around a campfire on a camping trip with a dozen local Hancock Park-area families, I myself was presented with an intriguing offer: “You wanna go to London to cat-sit?” I said yes, of course. My husband laughed at me, thinking I was kidding, but I said, “Why not? Why wouldn’t we take advantage of this opportunity?” He quickly saw the light, and within hours, and I mean hours, we had booked our flight for our family of four, plus my parents from Portland, Ore., to spend two glorious weeks in London. The cats’ house was located in the Battersea Park area of London, a prime location south of the River Thames. The two cats, Monty and Milo, were adorable, and we immediately felt at home. During the two weeks abroad, we befriended many of the locals, including Karim, owner of Cafe Blanca (best breakfasts in London), Dan from the Latchmere Pub (best Irish Coffees in London) and Antonio of AntiPasto (best Italian food in London). Living like a local, we were able to form friendships with people with whom we hope to keep in contact for the rest of our lives. Not wanting to waste a single moment of our precious time, we visited museums (British Museum, Victoria and Albert Museum, Natural History Museum, The Royal Albert Hall, Tate Modern), hit the shopping districts (King’s Road, Harrods, Brick Lane, Borough Market) and even managed to fit a few family events into the mix (ice skating at the Natural History Museum on Christmas Eve, a classic British Pantomime in Richmond, and High Tea at the London Savoy Hotel). For an excursion, we ventured out with England Experience Tours to visit Stonehenge, Avebury (largest Neolithic stone circle in Europe), Lacock (untouched rural medieval village owned by the National Trust) and Bath (a UNESCO World Heritage Site). The small group tour was ideal for my father, who is hard of hearing and would have hated a big bus tour. When we originally planned the trip, my 14-year-old daughter, who is learning French, asked, “Can we go to Paris while we’re there?” At first I said no, but then — when I realized how silly it was to be so close to Paris (two hours by Eurostar train) and to not take the opportunity — I reversed course. New Year’s Eve at the Eiffel Tower is one of those bucket list items that can’t be missed, so we sped off to Paris. During our quick, 48-hour Parisian New Year’s Eve getaway, an artist drew my daughter’s portrait in Montmartre, my son bought a Saint-Germain football (soccer) jersey, we explored the Catacombs under the streets of Paris (six million people, dating back to Medieval times, are buried down there), staggered from the rain into the Musee de l’Orangerie to view Picasso, Monet and Renoir paintings and ate our way through every crêpe stand, boulangerie and café we could hit. As noted, there are many different types of travel. Whether you travel with one person or 50, whether you lie on a beach and sip drinks all afternoon, go camping an hour from home, or decide instead to hit the ground running and pack in as many sites and sounds and foods as possible, the point is — do it. Travel is essential to the soul, and you’ll come back with new insight, new friends, a new attitude, and quite possibly even a new you.